When was the ceremony written? Disclaimer: Regardless of timeline this theory is based strictly on the ceremony. I have a theory that this ceremony was written 10k years ago in honor of the Hero from 10k years before BOTW. Why? 1. We only have 3 heroes being mentioned excluding the Hero who fought C.Ganon (during his first appearance). 2. The ceremony was an "imitating" ceremony, suggesting that it's based on a real ceremony. This takes into account his exclusion from the text (speech) but offer the correct chronology to align with the previous mentioned heroes. “Hero of Hyrule... Chosen by The Sword That Seals the Darkness." "You have shown unflinching bravery and skill in the face of darkness and adversity. And have proven yourself worthy of the Blessings of The Goddess Hylia." "Whether Skyward bound, adrift in time, or steeped in the glowing embers of twilight, The sacred blade is forever bound to the soul of the hero." No records of a hero after the one that was "steeped in the glowing embers of twilight" so the ceremony was in honor of the then current Hero of Hyrule...the same one who defeat C.Ganon with the then current Princess Zelda. The Hero from 10K years before BOTW. The post was edited 4 times, last by misisme33: finally fixed up the photo ( Dec 4th 2018, 1:43pm ). Come to think of it, the ceremony is a bit confusing in that all we know for sure BotW Link had achieved up to that point was drawing the sword. So saying he had "shown unflinching bravery and skill in the face of darkness and adversity" leads to questions. What has he done to show such skill besides pulling a sword out of a pedestal? Did he have to conquer 3 dungeons before being able to draw the sword like almost every Link before him? If so, why did no one ever mention it? It's like Nintendo just decided to skip over that part and expect everyone to go along with it. No wonder Zelda was pissed off in the cut scene -- for all we know, she was being expected to "bless" some guy who just tripped over the sword and now everyone's calling him a Hero when he had not yet done anything to earn the title. One thing about the ceremony that was always off putting was that we knew so little about the Hero who defeated C.Ganon 10k years ago. Granted in MC, you knew nothing about the former Hero of Men, however there wasn't a ceremony that acted as a historic log of all the former heroes who used the Four Swords. In CaC, BOTW Link is a skilled knight no doubt but as you said...he (at the time of the ceremony) doesn't compete in accomplishments compared to the Hero from 10k years ago. The ceremony doesn't in any way address the accomplishments of this mystery hero who like the former had the master sword and worked with Zelda to seal Ganon. So I guess that the ceremony was last done (officially) in honor of the Mystery Hero because at least the numbers will add up and we aren't excluding someone we know exists. The ceremony from BOTW is technically unofficial (I don't know if that is the best word but close to the affect). Which would make me assume that just pulling out the Master Sword isn't enough, you have to actually do something more worthy. We only have 3 heroes being mentioned excluding the Hero who fought C.Ganon (during his first appearance). Correction: no Hero is explicitly mentioned but five are alluded to (those from all the tentpole games (SS, OoT, TP, WW, and ALttP, in that order)). The Twilight Realm was basically wizard Australia where every naughty banished person was transformed into some sort of harmless albino penguins. WW is Nintendo's Up, basically. Link is Russell, Tetra is Doug, and uh, I guess maybe Tingle is Kevin? Although I disagree strongly that two other heroes are referenced in the ceremony, we still are presented with the same problem that is only exacerbated by the inclusion of 2 more Heroes. 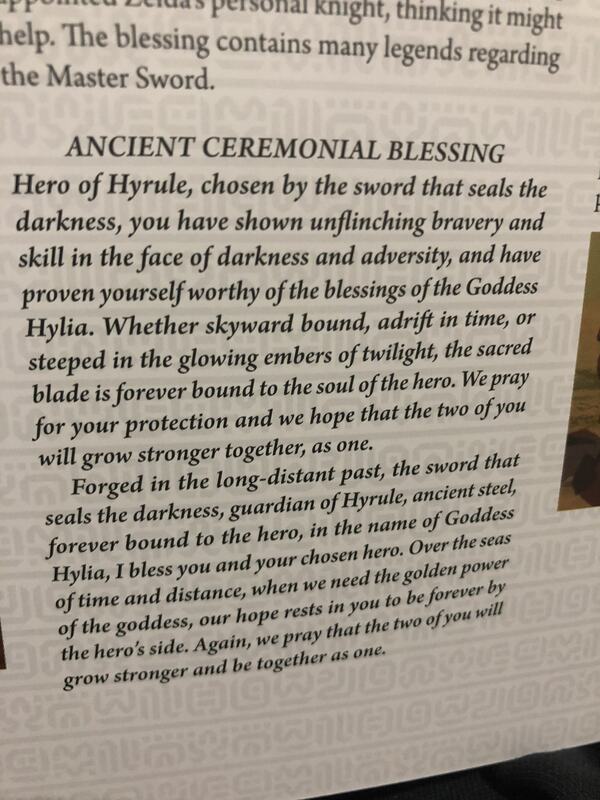 In other words, the ceremony still skips the Hero who defeated C.Ganon 10k years ago no matter how many heroes are mentioned. I think better with images so forgive me if this seems long winded. May you be alongside the hero"
"I pray so that further power lodges into the Demon-bane sword and the hero of Hyrule"
now let pretend that the Hero of Winds (not the Hero of Legends ) is referenced since the line "you cross the sea when you seek the gold make by the gods" is a singular event done by a singular person syntactically. We haven't fixed the original issue or confusion about the ceremony but have instead added on the problem. A). There are still only 3 Heroes mentioned in the Heroes portion before we get to the BOTW Link ceremony. B). The Hero of Winds in not referenced in the proper place in the ceremony. C). 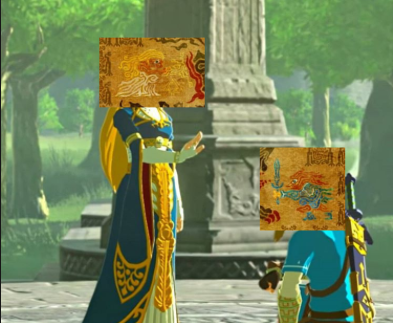 We have canonically 2 missing Heroes legacies by the time we get to the BOTW (100 years before present) ceremony for the BOTW Link. That is why I said that I said that I think the last official ceremony probably was 10k years from BOTW because it takes into account the correct number and is sequential. You add that the latter portion is referencing another missing Hero you make the time stamp of the ceremony more complicated. So what's the issue? You think it's in the CT and thus those three are the only three and all in order? And you didn't even address ALttP. Or is that who the "Hero of Legends" is, cuz that title's vague as hell. The Issue: regardless of timeline placement the ceremony doesn't mention the Hero who defeated C.Ganon. The main theory I was presenting was that the ceremony was written 10k years before BOTW because it would make sense why the Hero who defeated the then C.Ganon wasn't mentioned in the Hero section of the ceremony. Depending on timeline placement how more more heroes are missing from the ceremony. But I am only using the hero portion because that relates to the point of "when" the ceremony was written and when I think it was last officially performed based on the absence of the Hero from 10K years in said ceremony. If BOTW is in the DT, we still have the mention of SS, OoT, and TP Link but now we are missing 2 Links from LTTP and ALBW plus the Hero who defeated C.Ganon. 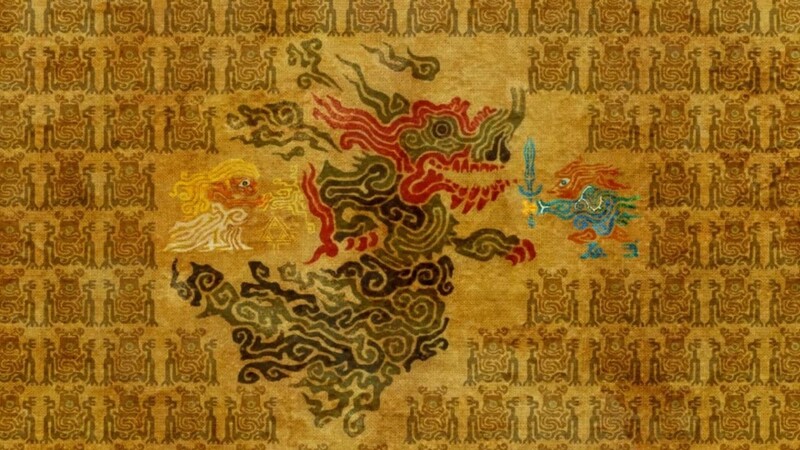 If BOTW is in the CT, we still have the mention of SS, OoT, and TP Link but we are still missing the Hero who defeated C.Ganon. If BOTW is in the AT, but now we are missing Link from WW and the Hero who defeated C.Ganon. Now me personally, the adventure described in the second portion of the ceremony describes a singular adventure, not two. I can half way understand WW being referenced theory because he did cross the sea and look for the "gold made by the gods". However, LTTP never crossed the seas in the search for the triforce. So I don't find that line referencing ALTTP credible. However, wither it does or not doesn't change the theory of when the ceremony took place. 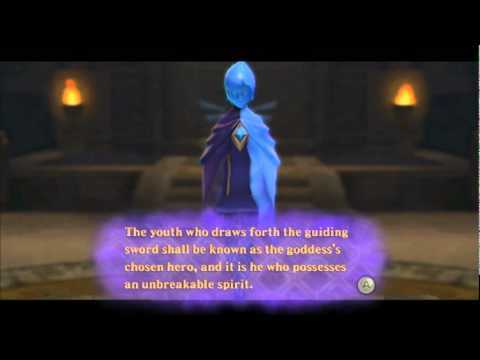 One commonality between all the tentpole games that is only shared with ALBW, and only by virtue of derision, is the fact that Heroes weild the Master Sword. If the Hero in BotW's backstory didn't, it would explain why he isn't mentioned. 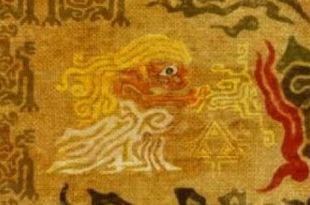 Could it be possible that Hyrule rediscovered their past when they found the guardians and the beasts 100 years ago? That would explain why Link uses a magic sword...and maybe racism turned the Zora into bad guys lol. Help from Impa might be some memory of Sheikah help, only she got turned into a servant, and the beasts and guardians were forgotten. Maybe SS OOT WW and TP were rediscovered too. The words of this blessing contain many legends regarding the sword of demons' bane. That said, I'm also fairly sure that they just wanted to reference the most popular games so that people would recognise them and go "Oh! I played that game!!1!" As for when it was written... I don't see enough evidence in the speech itself that could allow one to date it. The only thing I can say is that it was clearly written after everything previously in the timeline no matter which one it goes in; after all Aonuma already confirmed they're not making any clarifications about its timeline placement because they want us to decide for ourselves. So basically, if - for example - you see it fit to take place in the DT it would have been written long after the time of Zelda II, etc and so on. That's all we know. But I think since it's treated as though it's very ancient, I think it was written before the events of 10,000 years ago. But that's just my speculation. The post was edited 2 times, last by The Baton of the Wind ( Nov 30th 2018, 11:22am ). My whole point is that I think BOTW was written 10k years from BOTW-present to account for the missing Hero that is known. @misisme33 I get that but one of your points is wrong. You said only three heroes were mentioned but that's simply not true. And there are heroes after each of the last three of five referenced, it's just that the speech doesn't mention them; hence why I said they're making references to the most prominent Legends / most notable games. the adventure described in the second portion of the ceremony describes a singular adventure, not two. It is two. They're separated by spaces in the original Japanese the same as "sky, time, twilight" are separated by spaces. Hense why I say there are 5 heroes/legends being mentioned in the speech. The post was edited 2 times, last by The Baton of the Wind ( Nov 29th 2018, 10:30am ). I said "But I am only using the hero portion because that relates to the point of "when" the ceremony was written and when I think it was last officially performed based on the absence of the Hero from 10K years in said ceremony." The Heroes portion only has three heroes listed, any i wrong? So to your other point. I don't know japanes , so please feel free to help me out here. Even if you dance the skies, you travel through time or you are dyed in twilight"
"dance in the sky" "time patrol" "in twilight" "no matter what"
"No matter if dancing in the sky, time patrolling, or in twilight". I assume the particle that is meant to express "or", would make the sentence imply that one of these were done by the hero, no? "Or" implies alternative actions could have been done, no? You cross the seas when you seek the gold made by the gods"
"cross the sea" "God made gold" " "when I seek"
Those are the phrases I picked out. "I cross sea for gold made by god.". 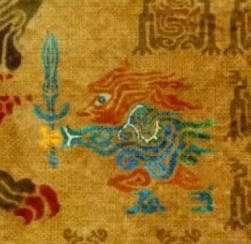 In context Zelda is addressing the sword which is the "I" as indicated by the address "Demon-bane sword born in a distant past". But for the sake of argument, let us pretend that the ceremony shafted yet another hero. 1. The address suggests that one person who is doing the action. 2. The sentence (this is where you come in) implies that the Hero crossed the seas for the intention of searching for the "gold". 3. ALTTP Link crossed oceans (LA), but it was never in the pursuit of the "gold". Firdt of all, you have the wrong character from [ 時を廻り ]. [ 廻り ] means "to surround", "to go around (in circles)", or "to revolve." Basically its saying he went "around" time; like going between two points in time - hense why I came up with "travelling through time." Secondly, you seem to have an outdated text of this speech done by people who were trying to hear it over everyone else talking. Here it is [above] in its actuality. Note that earlier I quoted Master Works and not the individuals online who (tried) translating the speech. Most of all, Japanese doesn't usually use spaces like we do in Engrish. If they're putting spaces between things, its usually to separate different ideas/things. Here they're spaced apart as if to list them. So "sky, time, twilight" are all spaced apart in the sentence. When they get to "seas" they space it apart from "seek the gold" as if they're two separate events, listed; as before. Hense why I say they are two different legends, especially since the foreword in Master Works says the speech includes "many legends." The post was edited 2 times, last by The Baton of the Wind ( Dec 3rd 2018, 8:20am ). In context Zelda is addressing the sword which is the "I" as indicated by the address to the Master Sword, no? If Nintendo wanted to make multiple references, why wouldn't they include the crossing of seas and searching for the gold in line with the rest of the actions associated with the heroes in the previous lines? Why put those references when the topic is addressed to the master sword? Don't get me wrong, the correct text helped out a lot. No, you're right. The 2nd portion is blessing the sword itself. And that is why more references are made. The sword travelled with TWW Link across the seas, and while it is true he was also seeking the Triforce of Courage; it is also true - and far more relevant imo - that in ALttP the Master Sword travelled with Link while seeking the whole Triforce or the whole of the gold made by the gods and not part of it. So isn't that cherry picking then? When the address is the hero, we don't attribute the Master Sword skyward, through time, or in twilight. 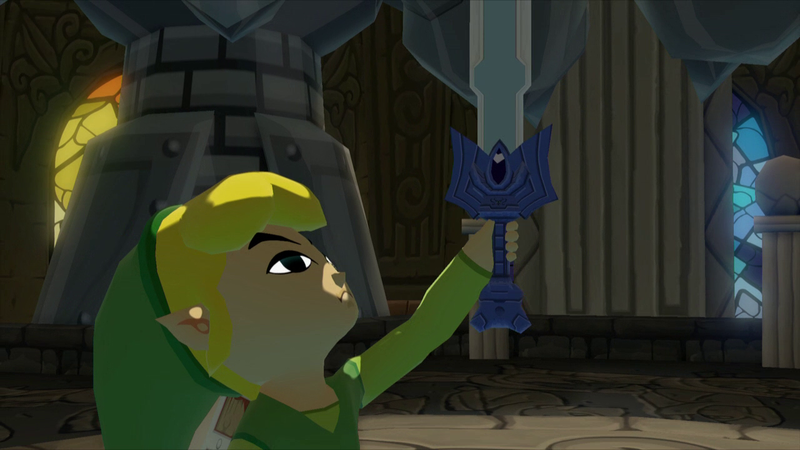 We attribute those acts to the hero while acknowledging the Master Sword was there. In essence, the Hero is the active party doing the acts and the Sword is the passive party (essentially a tool). Why is it that when the address is to the master sword, we switch he role of active and passive party? 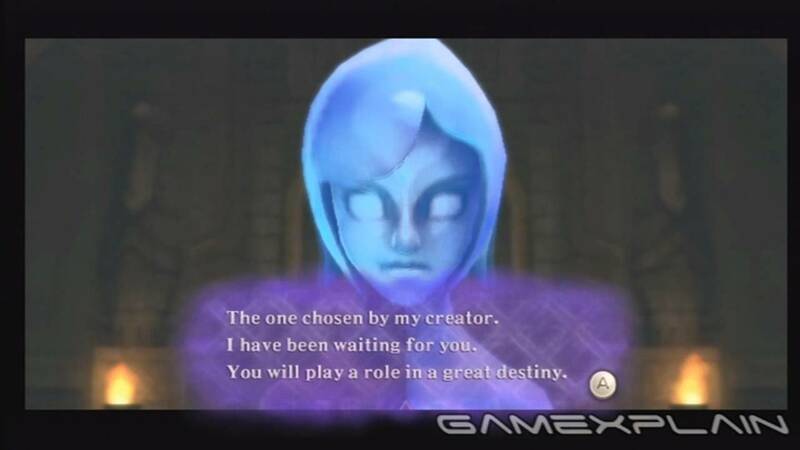 In the second portion addressing the Master Sword, the Master Sword should be the one who is the active party in the adventure while the Hero is the passive party. Does this make sense? Moved from Small Breath of the Wild Theories. The subsequent discussion became much more than "small". The post was edited 1 time, last by Violetlight ( Nov 29th 2018, 6:22pm ).